Say hello to the Huawei Mate S, the world's first smartphone with Force Touch technology. Kind of. 'Force Touch' I hear you quizzically ponder, 'isn't that Apple's thing?' Well yes, it's the fancy screen tech you find in the Apple Watch and the trackpad of the new MacBook - and yes, Huawei was the first to stick it in a smartphone. It managed to get in a whole week before Apple announced 3D Touch on the iPhone 6S and 6S Plus - which is basically the same technology, but the Cupertino firm's implementation is more fully formed than Huawei's effort. I say 'kind of' in my opening line because you may have some difficultly getting a Mate S with Force Touch. It comes in three models; 32GB, 64GB and 128GB but it's only in that last model, the 128GB one, where you'll find Force Touch. SIM-free the 32GB model can now be had for a relatively modest £380 (US$500, around AU$750) with availability wide spread. If you're in the market for the 64GB or 128GB Force Touch model then things aren't so easy as they are still hard to come by. Huawei did have a limited number of 32GB Mate S handsets with Force Touch available on its online shop for £569 (around US$800, AU$1,100), but that stock has been sold out for a while. The Mate S is a premium device, and with its 5.5-inch display it shapes up nicely against the iPhone 6S Plus, OnePlus 2, LG G4 and it's even gunning for the Samsung Galaxy S6 and Sony Xperia Z5. The Huawei Mate S builds on its predecessor when it comes to design, with a slender 7.2mm all-metal frame looking and feeling suitably premium. The slightly curved rear means it sits nicely in the hand, and while it has the same screen size as the iPhone 6S Plus, Huawei's kept bezels to a minimum meaning it's shorter and narrower at 149.8 x 75.3mm. It's far more palm-friendly than the Ascend Mate 7, with its mammoth 6-inch screen which really tested one-handed usage to the max. At 156g it's surprisingly light considering its size, and I found it comfortable to hold and its 7.2mm thick frame slipped into my pocket without issue. The volume and power/lock keys are located on the right of the handset towards the top, and for me they were reasonably easy to hit. I can see their placement potentially causing problems for those with smaller palms though. A way round the potentially awkward placement of these buttons, and the general size of the Mate S, can be found on the back. Below the 13MP camera sensor there's a fingerprint scanner. 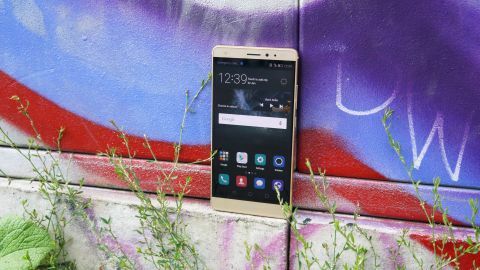 Huawei has updated the software used here for the Mate S, with Fingerprint Sense 2.0 bringing greater sensitivity and increased recognition. It's certainly responsive, when it works, unlocking the Mate S in a blink of an eye when I touched my finger to the sensor. It's not quite up there with Apple's Touch ID or the sensor on Samsung's Galaxy S6 range, thanks to its slightly odd positioning and hit and miss performance - but I've used much worse. That's not all the fingerprint scanner can do though. You can also use it to take a photo, scroll through images in the gallery, answer calls, pull down the notification panel and silence an alarm. I did find swiping down on the scanner to display the notification panel required a certain level of finesse and accuracy, but once you get your eye in its handy not having to stretch a finger all the way up to the top of the display. In fact, it's so useful that when transitioning to another handset I found my finger instinctively reaching for the finger scanner on the rear to bring down the notification panel. That just shows what a useful feature it is, and it's something that's sorely missing from the Huawei-made Nexus 6P. Trouble is, with the sensor located on the rear of the handset you can't use it to unlock the Mate S when it's sitting on your desk. This forces you to either pick up the phone, or hit the power/lock key and then tap in your pin. It's a frustrating situation, especially if like me you find yourself sitting at your desk most days, and one that could be easily solved. Overall though I'm fond of the design of the Huawei Mate S. It's one of the company's best looking handsets to date, and it feels like a premium handset. Sit it next to the top of the line iPhone, Samsung and HTC and it's not out of place.